This 1963 34mm. OMEGA SEAMASTER has a very clean gold capped case with stainless steel raised relief sea monster case back and OMEGA winding crown. 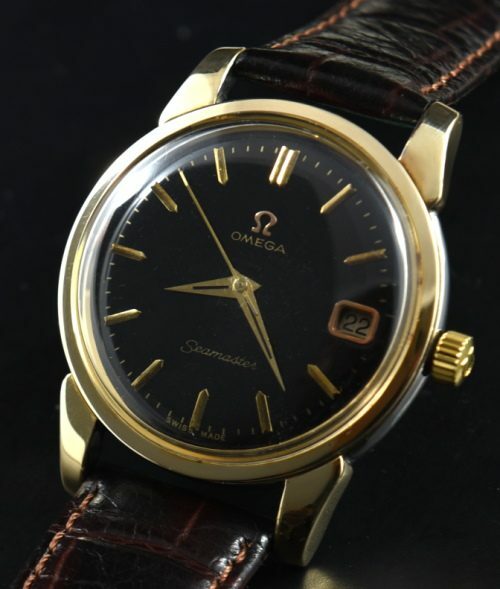 The fine automatic caliber 561 automatic OMEGA movement was just cleaned and is accurate. The striking black dial was expertly restored and really “pops” on the wrist. The Dauphine hands are original. The calendar is a handy feature. You will love how this watch looks on the wrist!